Stretch mark cream: Pai (part of a set). Japanese Camellia body oil: £37, Elemis. Udderly gorgeous bath and shower gel: £18, Cowshed. Bath oil: £18, Bloom & Blossom. 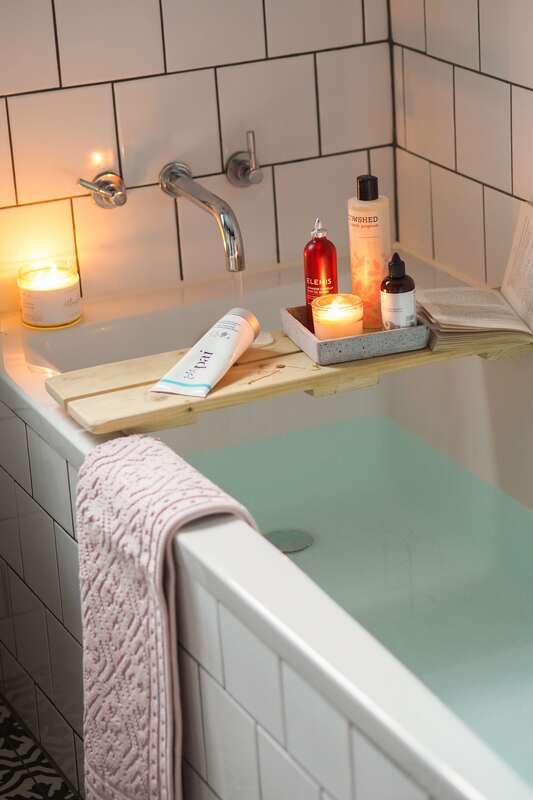 Wooden bath caddy: Etsy. Concrete tray: Granit in Stockholm. I know a lot of people say it’s superstition, stretch marks are hereditary and you don’t need to buy anything specific during pregnancy but I must admit, a few indulgent beauty products have really kept me that little bit more sane during my pregnancy. 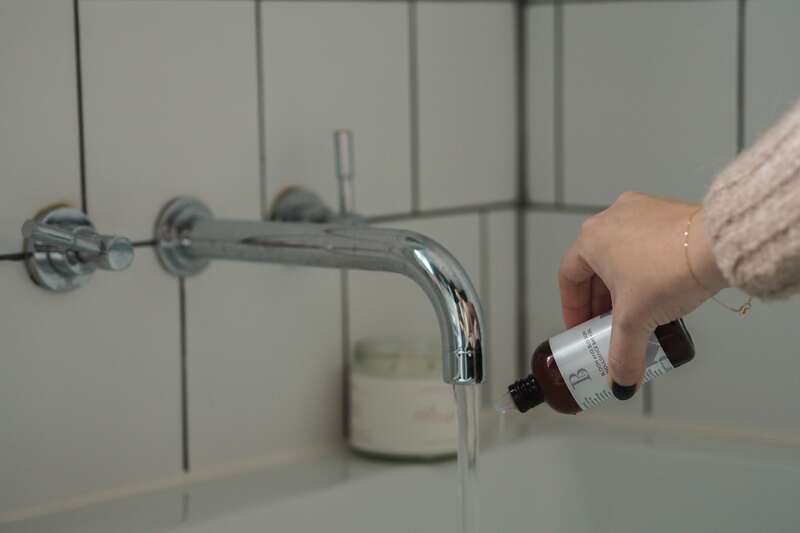 Running a bath after a day of painting and DIY, or even just staying in the bathroom 10 minutes longer after I’ve got our of the shower, applying oils on my skin and enjoying the quiet time (whilst it lasts!) has been my main solace amongst the madness of the past 8 months. I was fortunate enough to be sent a few beauty items through my pregnancy, so it gave me to try a few different products I possibly wouldn’t have known about as well. 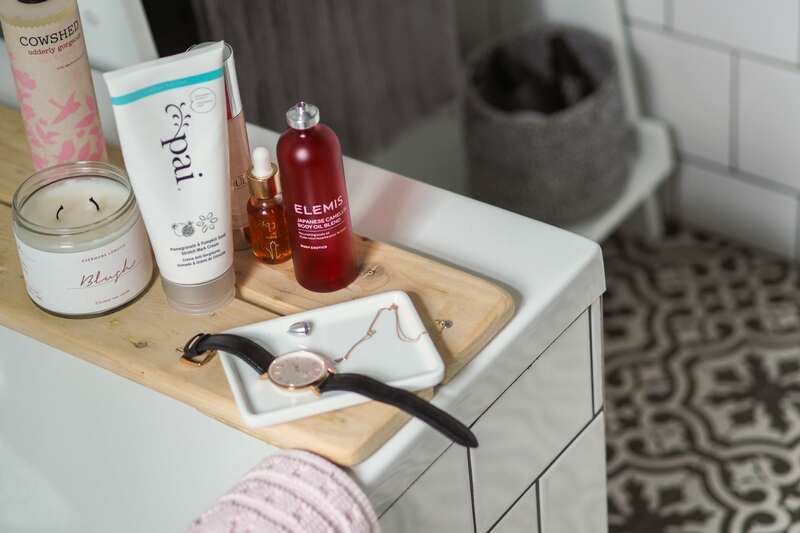 The Pai stretch mark system, for one – I love the natural ethos of Pai (and their rosehip oil is already my winter skin saviour) and the stretch mark cream is joyous to rub on in the mornings to give my skin that supple feeling – especially when my stomach usually feels so tight and stretched (especially after eating). Yes, it adds another layer to your routine – moisturiser in the morning and oil at night but as I said, I’m enjoying the quiet time. 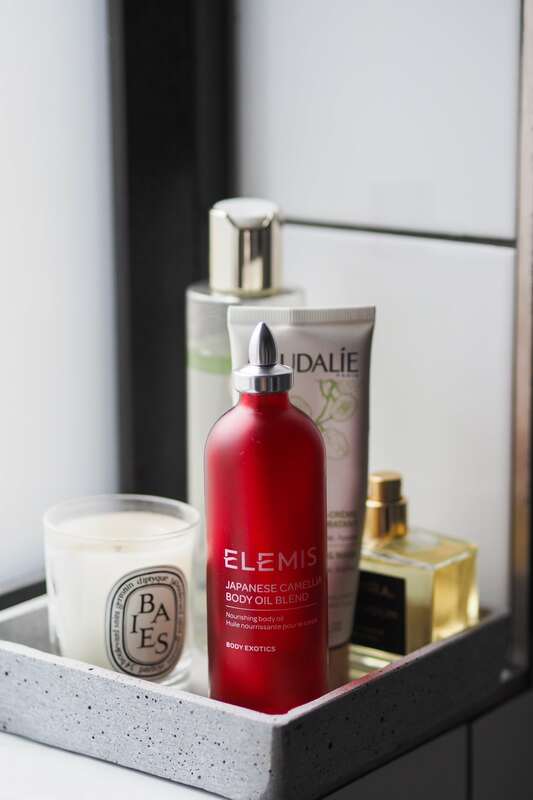 In the evenings, I use Elemis Japanese Camellia Body oil – it smells incredible – the tiny little lid is a tad awkward (I drop it every.single.time) but it glides on beautifully – and it’s apparently what Victoria Beckham used throughout her pregnancy so if it’s good enough for her…. Someone on Instagram reminded me not to just rub it on my belly, either – and knowing from school that I got stretch marks on my lower back and thighs from a growing spurt, I made sure I tackled problem areas, too. 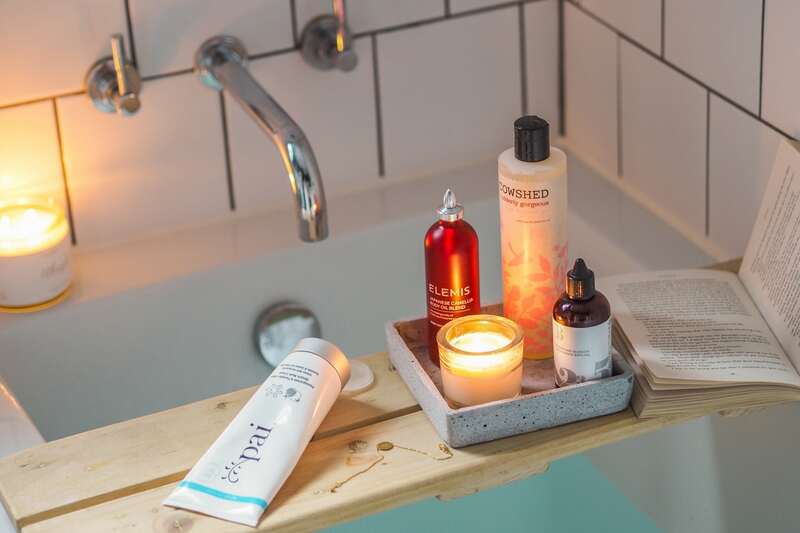 It may be hereditary and depend on your skin type but nevertheless, I’ve quite enjoyed my alone time spoiling my skin – I’ve always complained I never had the time before but once you make time, you feel so much better for a decent skin regime. And in the bath? 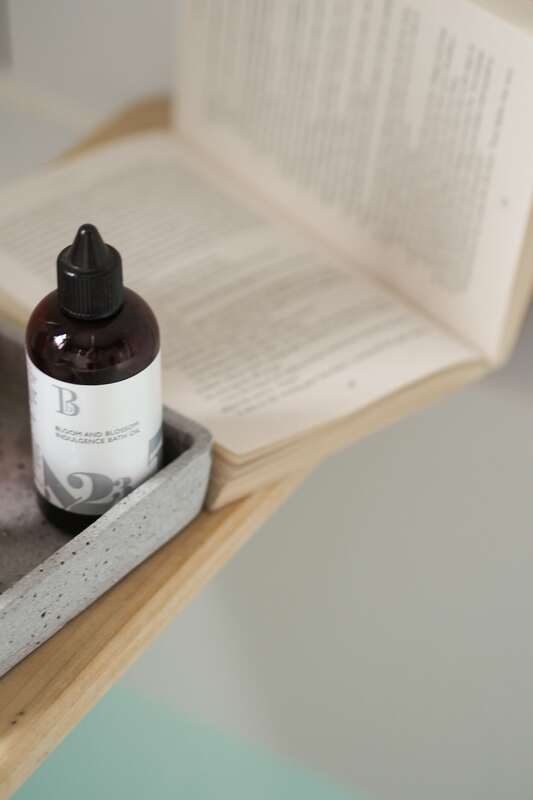 This Bloom & Blossom bath oil is gorgeous – lovely Helen from Wood/Grey (a friend made through Instagram) bought this for me as a congratulations present – and it makes bath time that little bit more special – and not to mention leaves your mind guilt free as it’s pregnancy safe (I had a bit of a panic when working with clary sage for a blogpost – I didn’t realise it could be an abortive!). Be careful when getting out as the oil can sometimes be a bit slippery – I always make sure I rinse the bath out properly afterwards. I spoke a little bit on instagram Stories recently how my skin was the best it had ever been – I had always heard this was the case but didn’t truly believe it would happen to me (someone who has had adult stress induced acne for the past 15 years). And yes, it happened to my hair too – it has been so shiny and easy to style (my usual hair doppelganger without product is Hagrid from Harry Potter) – so nice in fact, that I have resisted getting it cut during pregnancy – I thought I’d make the most of it and try and enjoy longer hair for a while. Before it goes back to normal, I get angry and chop it all off. 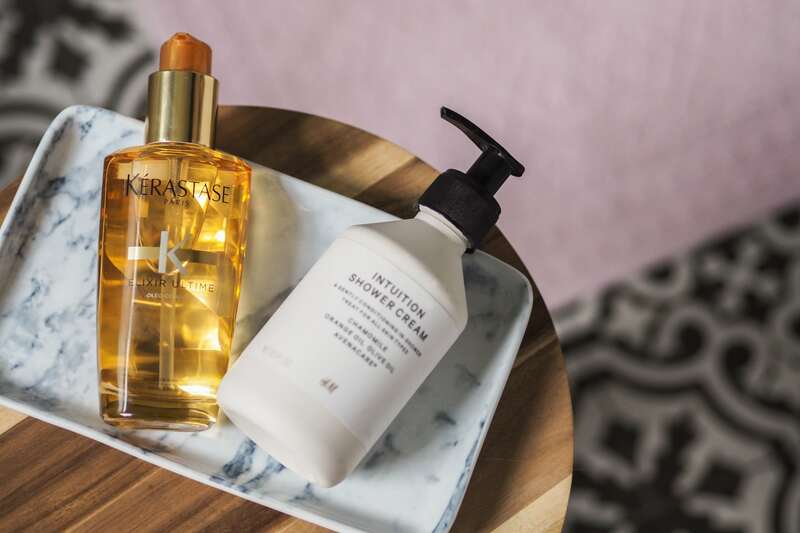 I will just use a High Street shampoo like Tresemme or H&M, but keep up with the oils post washing…Kerastase’s ‘Elixir Ultime’ is by far the best for my hair (and luckily, lasts for ages so cost per wear, makes a lot of sense). Ultime hair elixir: £29.60, Kerastase. Shower Creme: H&M. The next product scares me slightly, but needs must! 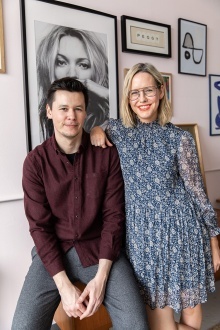 I’ve been given mixed responses regarding the pereneum massage – Mother of Daughters Clemmy recommends doing it, but a few on Instagram have said it doesn’t make a difference. I suppose what will be will be, but it’s worth a shot! I’m already in the bathroom for ages post shower these days so I might as well add something else to my regime…! Just hope no one walks in on me…. Pereneum massage oil: £7.45, Weleda. 101 ointment: £8.79, Lanolips. 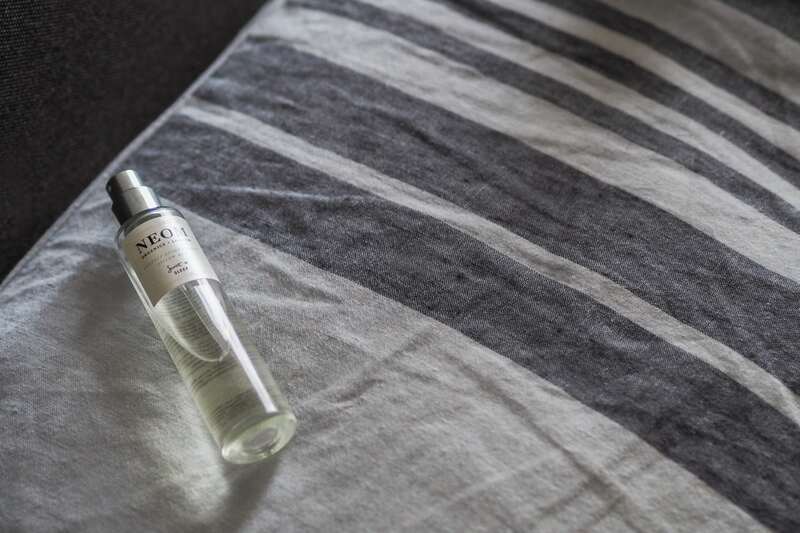 Pillow mist: £20, Neom Organics. My sister has recommended Lansinoh as well for breastfeeding. as there is no need to remove before feeding. 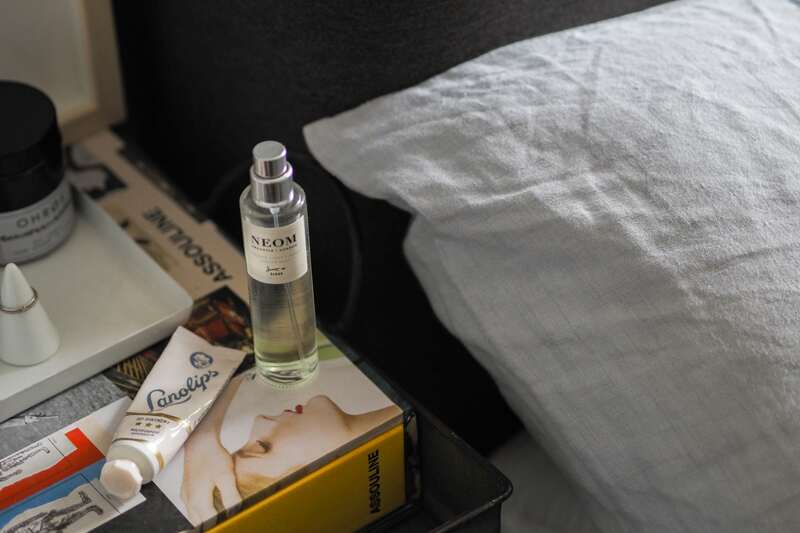 Pillow mist: £20, Neom Organics. Bed linen: Soak & Sleep. Any other tips I’m all ears…! Omg! 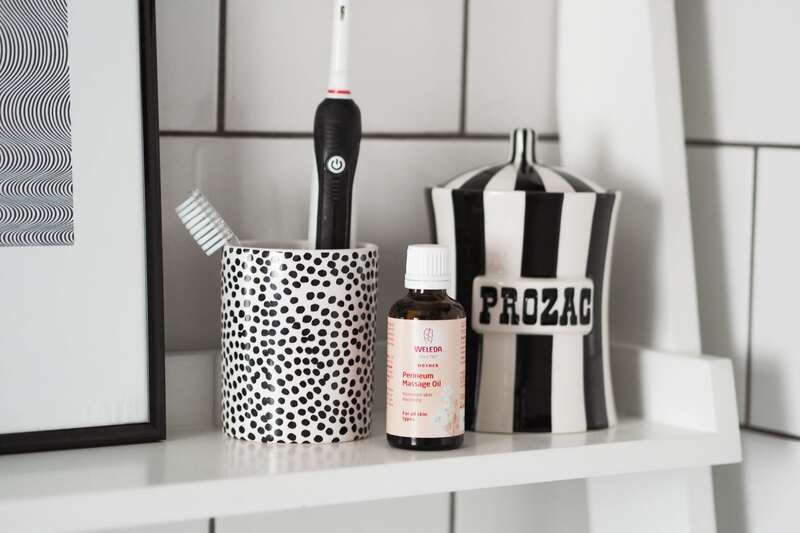 That PROZAC container! In love! Please please, may you tell me where did you buy it? Do the perineum massage!!! It may well be bunkum but I did for both of mine and it stands to reason that strong supple skin is going to withstand that mega-stretch more than, well, not! In fact when I started reading your post I already decided to mention oiling the undercarriage ? If you feel like some extra indulgence I would definitely recommend the Susanna Kauffman range, the bath oils are a must!! Liberty’s and Space NK have them online.